Britain's Hammer Studios were to begin the nineteen-seventies seemingly geared up to continue as they had done in the sixties, churning out a bunch of horror pictures every year, and enjoying the fruits of co-production deals with Warner Bros from Hollywood. However, they were to end the decade stuttering to a halt and making the move to television as all their movie deals had fallen through, and it was not until the twenty-first century that the brand was revived with a selection of fresh titles that decided not to prolong the franchises they were best known for and had made their names with from the mid-fifties onwards. It was clear even in 1970 that their output needed a shot in the arm as a new permissiveness entered modern cinema, and to answer that they started including stronger violence and sexual elements with their trilogy of lesbian vampire films commencing with The Vampire Lovers that year. The Frankenstein series, previously a solid reliable for them, tried a reboot with Ralph Bates in the title role, which more or less signalled the death knell for the character as Hammer portrayed him: star Peter Cushing and director Terence Fisher were invited back for one more try, Frankenstein meets the Monster from Hell, but it put an end to them for good. The Dracula series was a different proposition, as that had legs (or wings) since you could place a collection of bright young things in their settings and have them menaced by the Count, as the new youth culture was dictating where the studios were chasing the profits, and rebellion was the order of the day, hence their fifth attempt at the classic tale, Taste the Blood of Dracula which arrived a few months into 1970, the first of two Dracula movies from them that year. This, too, was a departure, but a more successful one, and Christopher Lee had been coaxed back. Lee was always reluctant to play the character that had made him famous, forever quibbling with the lines he was given, or the actions he was meant to do, and looking to Bram Stoker's original conception of the vampire as the "correct" way to do these stories. Nevertheless, it appeared if the paycheque was big enough he would sign on the dotted line over and over, and would do so for four out of five Dracula instalments from Hammer this decade, though in this one he was not given a tremendous amount to do (another reason he would claim to be unhappy with the part). He showed up right at the start as Roy Kinnear finds the wounded Count in the forest and gathers up his remains, eventually selling them to three middle-aged gents seeking thrills the local brothel doesn't hold for them anymore. Goaded on by louche Lord Ralph Bates (the 1970 Frankenstein and Hammer's new acting hope), they conduct a Satanic rite to revive him. Or that's the plan, but in effect they chicken out, Bates tastes the blood, and is beaten to death by the trio, encouraging Drac to set about vengeance by turning their (grown) children against them. Linda Hayden led these younger characters, much as she would in the far better thought of cult classic Blood on Satan's Claw around the same time, and these narratives pitting the generations against one another were by no means exclusive to British horror. Though Taste the Blood of Dracula was regarded as just another entry, it was in truth one of the stronger efforts thanks to a clear moral sense of corruption versus purity, and a plot that made interesting use of the vampirism in a way many of these would not. It was, however, an indication that Hammer's Dracula was not going to follow a path that veered too close to traditionalism in the seventies, not so much because they were keen to push boundaries, more because they were betraying a lack of confidence. That said, the same year's next entry, Scars of Dracula, reverted to type and presented a tale that would not have looked out of place in the previous decade, back to basics with one exception: it ramped up the violence quotient. Dracula is about blood, right? So why not drench a movie about him with the red stuff? As the censorship slackened, the gore could make an appearance like never before, and although there would be gorier horror films to come, making this effort look rather tame in comparison, under old hand Roy Ward Baker's direction the clash between the traditional ways of manufacturing Hammer tales and the style of chillers on the way was never more blatant than it was here. It was planned as the second half of the double bill with the more comedic Horror of Frankenstein, and a statement of intent that Hammer were able to move with the times - but something important was missing. 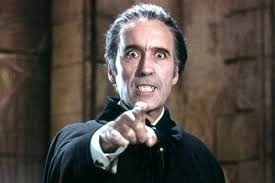 Not onscreen, Christopher Lee had been coaxed back once again, for example, but behind the scenes the final nails in Hammer's coffin were about to be, er, hammered in as the American money had finally dried up. This had been a crutch for the company for many years, but without distribution deals that Hollywood could provide, their output had nothing but struggles ahead, and boss Michael Carreras was making plans to wind down the studio. As mentioned, it did limp on, eventually in television and then as a comeback kid for the silver screen, but it was clear from what was a rather staid production aside from the violence that they were not so much moving with the times as trying to hold back the tide. As the seventies dawned, Satanism and zombies would be the injectors of fresh blood into the genre as it continued to evolve, and Hammer came across as yesterday's hero in the market. But in 1970, they were not out for the count quite yet. In fact, they were in with the Count, and with Lee continually persuaded to return they at least had their star, just as well when the other leads were future kids' magazine show Magpie presenter Jenny Hanley and future theme song-penning star of The Sweeney, Minder and New Tricks Dennis Waterman who were not the best match to the material Hammer could have found. No matter how many times they zoomed in for a closeup on Hanley's cleavage (seriously, don't try a drinking game with that shot, drink sensibly) she didn't convince as a plucky heroine when she seemed to spend most of the running time asleep or under the influence of Drac. Waterman, meanwhile, was nobody's idea of dashing as his character tried to find out what happened to his brother up at the castle, and former Doctor Who Patrick Troughton probably outacted everyone with his sinister manservant act, including Lee whose discomfort was palpable. You do wonder why the most celebrated Dracula star was so reluctant to return to the role and needed so much coaxing when, for Hammer at least, he was only present in their series for a very limited number of scenes: it must have been an easy gig, if nothing else. Rumours were he was guilt-tripped into it. Apparently, what made up his mind to do Dracula A.D. 1972 was the inclusion of a line adapted from Stoker's original text, that's right, one line, but he did show up and collect the paycheque, even if the sense he was too precious about a role audiences loved to see him in regardless of the lack of quality was difficult to dismiss. With this little item, it may have kicked off in Victorian times with a surprisingly excellent, action-packed pre-credits sequence detailing the Count and his arch-nemesis Professor Van Helsing's final confrontation that had them both expiring (Drac with a spoke from a cartwheel through his heart), but soon we were off to the present day. Or present night. Or maybe neither, since with a title like Dracula A.D. 1972 featuring the year of release prominently, it dated as quickly as the date changed to 1973, another example of how Hammer were desperately trying to stay as current as possible without much thought to any sort of legacy. The results were almost universally lampooned down the decades, yet the further away it got from the point it was unleashed on an unsuspecting world, the more entertaining it became; certainly it was embarrassing to hear the younger cast, who frankly weren't as young as the script claimed them to be, spout the achingly hip lingo of the screenwriter Don Houghton's idea of how ver kids interacted in those heady, post-hippy days, but time heals all wounds, even bites in the neck, and the advancing years rendered the posturing perversely amusing. 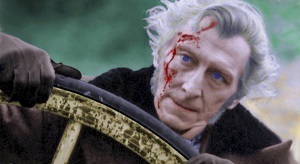 Naturally, Lee and Peter Cushing (returning to the franchise) did not participate in trying to be cool. They were cool already, simply cool from a different generation, so no velvet loon pants on the Count or the Prof sporting an ankh instead of a cross around his neck, though there was no guarantee the producers didn't consider it judging by what their co-stars were dressed in. Dracula's enabler this time was Johnny Alucard, nicking a trick from the forties Universal entry Son of Dracula by spelling the moniker backwards and managing to fool everyone (how?!) except Van Helsing; he was played by a scheming Christopher Neame. Dracula's sights are set on Jessica Van Helsing (Stephanie Beacham), however, the granddaughter, who really had more screen time than the two top-billed stars. It was a mark of where horror was heading in the run-up to the Hammer-destroying The Exorcist the following year that Satanism was already a watchword for seventies chillers, and so it was here with Caroline Munro sacrificed in a black mass at a deconsecrated church. Director Alan Gibson, who helmed Dracula A.D. 1972, saw his services retained for what would be the penultimate in the series, though effectively it may as well have been the last. The Satanic Rites of Dracula set Lee grumbling that Hammer were abandoning the source in their drive to keep up to date, and there was a sense that was true, but in another there was little point in retreading the same plot over and over, and by this entry it was clear something fresh in the approach was needed. Whether it was to take a cue from another Lee franchise character, Doctor Fu Manchu which he had played for a number of movies in the sixties, was a different matter, and though positing the bloodsucker as what was often referred to as a vampiric Howard Hughes here was original, it did mean the character's tendency towards reclusiveness meant if anything, the Count was seen even less in this, Lee's final Hammer Dracula, than ever. Cushing was back, on the other hand, and getting more to do as Lorimer Van Helsing, the returning descendant from 1972, as was Jessica, his plucky granddaughter, though this time played by Joanna Lumley as Beacham was unavailable. She proved just as useless as before, landed with the oft-screaming victim role and patronised by the men, who were largely the most important in the plot and mainly a bunch of government officials and law officers who took care of the lion's share of battling Dracula's conspiracy. Once again we were in the midst of the Dark Arts, opening with an extended scene of a black mass where the likes of Freddie Jones performed a ritual with a bare naked lady and a cockerel, all pledging their joint allegiance to their boss and the Devil himself, but this was far more Dennis Wheatley than Bram Stoker, and blatantly aiming to cash in on the renewed interest in Satan in the wake of the blockbusting The Exorcist. Of course, The Omen too was right around the corner, doing rather better in the box office stakes (hah!) than The Satanic Rites of Dracula as it tapped into the ancient evil abroad in modern times stylings better than Hammer were managing. The scheme that the villain was concocting was somewhat confused, at one point inventing a super-Black Death to wipe out humanity, for Van Helsing says he wants to end his own life in a blaze of anti-glory and take us all with him, but he doesn't seem the type to indulge in self-destruction, and when confronted he proclaims something about setting off his own Apocalypse with his own Four Horsemen to do his infernal bidding. From that we can deduce that even Houghton's screenplay was not one hundred percent sure of what it was meant to be - spy story? Modern Gothic? Horror detective yarn? - but no matter its poor reputation, this did contain plenty of interest, not traditional Dracula but with a weird verve. Seeking another partner for a collaboration, Hammer next went East to the then-British colony of Hong Kong and the main studio for kung fu movies, Shaw Brothers. They were both known for their genre works and ploughed a furrow of their own in much the same way, and would more or less sputter out around the same time, though Run Run Shaw was more prolific than the British company, yet each were identified with a specific period of time within the horror and martial arts styles specifically. As the Eastern studio was distributed across the world often in dubbed and edited versions, Hammer would also have their product released in much the same way outside of Britain and it was true to say neither would ever attain any huge respectability, while being the sort of filmmakers sought out by aficionados of their material, yet The Legend of the 7 Golden Vampires never reached a reputation that complimented either. That could be because there was a sense that Hammer had hitched its wagon to the Shaws', without trying to truly meld their approaches and subject matter with any slickness, and it was hard to argue that the results were anything other than clunky. Cushing opted to return as Van Helsing (presumably the son of the one killed off at the beginning of Dracula A.D. 1972, as this was set mostly in 1904 - there was assuredly a family resemblance) but for Lee this was the final straw, and John Forbes-Robertson was hired for bookending scenes as for the greater part of the plot the Count had possessed the body of a Chinese villain (Chan Shen) to expand his brand, much as Hammer were doing, funnily enough. To do this, he had a curious set up where he took over a region of China to help himself to their virgin ladies, who he would shackle to tables and drain blood from into a bubbling cauldron in the middle of his main hall. Quite what the purpose of that was is unclear, but it was a striking image in a film that relied too heavily on anonymous stuntmen battering the hell out of one another, one group playing the seven grotty-faced vampires. The ostensible hero, aside from Van Helsing (Cushing looking more cadaverous than ever) was played by David Chiang who believed the Professor about the threat to his homeland from Dracula and journeyed with him, his nephew Robin Stewart, and their benefactor Julie Ege, to the site of the evil in order to vanquish it. The trouble being, the white actors looked pretty much superfluous when trained kung fu was the best way to despatch these monsters - Shih Szu was also there as Chiang's sister, and while they both romanced Stewart and Ege respectively, the bolted together nature of the constituent parts was simply too blatant to ignore. Despite Roy Ward Baker returning to Hammer to direct, it had to be judged a Shaw Brothers movie first, and that was it for Dracula under this banner, as when Hammer moved to television and had their later revival, they showed no interest in him any further. Their seventies efforts represent a bizarre mixture of the traditional and the would-be trendy, fixing them in time in intriguing ways.